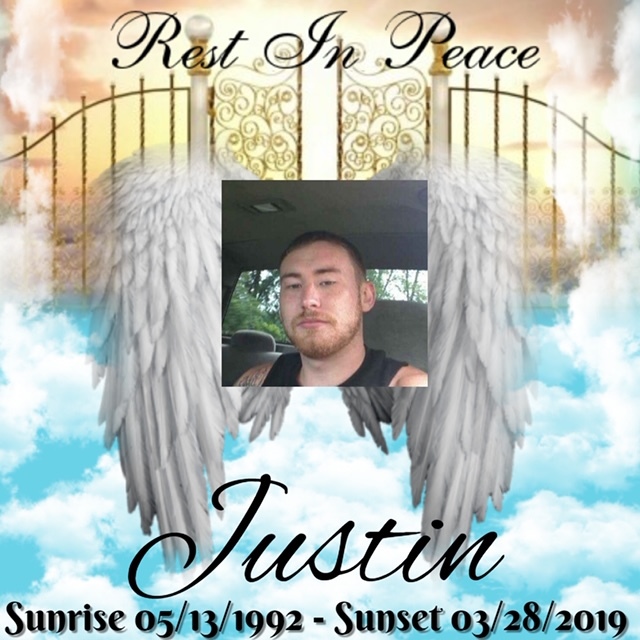 Justin Tyler Schmidt, 26, of Wooster, died Thursday, March 28, 2019 in Orrville. Friends may call Monday from 2 to 3 p.m. at Roberts Funeral Home-Sherwood Chapel, Wooster. Services will follow at 3 p.m. at the funeral home. Burial will be at Sherwood Memorial Gardens. Online tributes may be made at www.RobertsFuneralHome.com. Justin was born May 13, 1992 in Orrville to Robert Leonard Schmidt and Pamela Graham. Justin loved animals, especially his dogs. He most loved spending time with his family and friends. Justin will be deeply missed by his mother Pam of Wooster; father Robert (Vicki) of Orrville; brothers James Schmidt and Matthew Pinkley; sisters Mandy, Julie and Jessica Schmidt; maternal grandparents Wanda and Jack Graham; several aunts and uncles, especially his aunt Jackie and cousin Jason, who he loved dearly; mom two Pam Schmidt; nephew Damian “DJ” Schmidt; and numerous other cousins and friends. Justin was preceded in death by his brother Robert “Travis” Schmidt, paternal grandparents.